Did you know that if you’re self-employed you may be able to set up a retirement plan that allows you to contribute much more than you can contribute to an IRA or even an employer-sponsored 401(k)? There’s still time to set up such a plan for 2017, and it generally isn’t hard to do. So whether you’re a “full-time” independent contractor or you’re employed but earn some self-employment income on the side, consider setting up one of the following types of retirement plans this year. This is a defined contribution plan that allows discretionary employer contributions and flexibility in plan design. (As a self-employed person, you’re both the employer and the employee.) You can make deductible 2017 contributions as late as the due date of your 2017 tax return, including extensions — provided your plan exists on Dec. 31, 2017. For 2017, the maximum contribution is 25% of your net earnings from self-employment, up to a $54,000 contribution. If you include a 401(k) arrangement in the plan, you might be able to contribute a higher percentage of your income. If you include such an arrangement and are age 50 or older, you may be able to contribute as much as $60,000. This is a defined contribution plan that provides benefits similar to those of a profit-sharing plan. But you can establish a SEP in 2018 and still make deductible 2017 contributions as late as the due date of your 2017 income tax return, including extensions. In addition, a SEP is easy to administer. For 2017, the maximum SEP contribution is 25% of your net earnings from self-employment, up to a $54,000 contribution. This plan sets a future pension benefit and then actuarially calculates the contributions needed to attain that benefit. The maximum annual benefit for 2017 is generally $215,000 or 100% of average earned income for the highest three consecutive years, if less. Because it’s actuarially driven, the contribution needed to attain the projected future annual benefit may exceed the maximum contributions allowed by other plans, depending on your age and the desired benefit. You can make deductible 2017 defined benefit plan contributions until your return due date, provided your plan exists on Dec. 31, 2017. Additional rules and limits apply to these plans, and other types of plans are available. Also, keep in mind that things get more complicated — and more expensive — if you have employees. Why? Generally, they must be allowed to participate in the plan, provided they meet the qualification requirements. 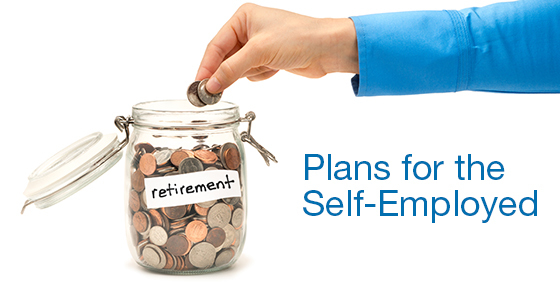 To learn more about retirement plans for the self-employed, contact us.